Walking distance to ocean, this beautiful West facing 3 bedroom 2 Â½ bath Mediterranean front unit townhome has it all. The main living boasts an open floor plan which is perfect for entertaining. If you love to cook you will enjoy the spacious kitchen with an oversized island, Viking appliances, granite countertops, and ample storage. Enjoy the sunrise and sunset from multiple viewing spots throughout, including the kitchen and roof top deck. A generous sized balcony is a wonderful place to relax on warm nights, bbq or entertain guests. Conveniently, all bedrooms are on the second floor. The master bedroom is a welcome retreat including an ambient fireplace, french doors, a custom-built master closet, and an en-suite complete with double sinks, a soaking tub and shower. The two additional bedrooms and full size bathroom complete the floor. The entry level includes laundry, a two-car custom garage that was designed by California closets to store your surfboards, skis, beach cruisers, and more. Additional features include wood flooring, new carpets, plantation shutters, an outdoor shower and a large rooftop deck with sweeping views of the ocean. 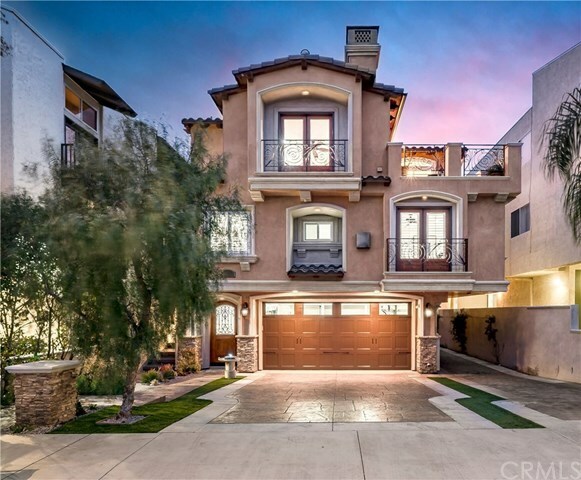 The home is centrally located between the Hermosa Pier & Redondo pier, the greenbelt, and in close proximity to local restaurants and boutiques.